Duration: 4 min 54 sec. On March 30, 2018, the plenary session of the 9th St. Petersburg International Education Forum "Modern Education: New Reality" was held at the Presidential Library. The meeting was attended by members of the Government of the Russian Federation, heads of the Ministry of Education and Science, the Federal Service for Supervision in Education and Science, teachers, scientists, cultural and scientific figures. The main events of the forum were held on March 28-30, 2018. Representatives of 40 Russian regions and delegations from Armenia, Belarus, Bulgaria, Kyrgyzstan, Kazakhstan, Mongolia, Turkmenistan and the Czech Republic took part in them. . I. Evseeva, Marina Igorevna. II. Stanyakin, Anatoly Petrovich. III. Kondrashov, Kirill Alexandrovich. IV. Furmanova, Julia Nikolaevna. V. Khudyakova, Alexandra Sergeevna. VI. 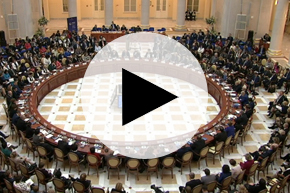 Petersburg International Education Forum (9, St. Petersburg, 2018). VII. Presidential Library (St. Petersburg) .1. Presidential Library (St. Petersburg, city) - Activities - 2018 - Multimedia publications. 2. St. Petersburg International Education Forum (9; 2018) - Multimedia publications. 3. The people (the collection). 4. Power (collection). 5. Education - Russian Federation - Multimedia publications.